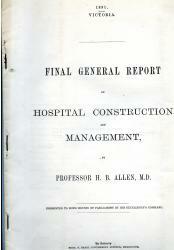 Final General Report on Hospital Construction and Management. Presented to both Houses of Parliament by His Excellency's Command. [1891. Victoria.] By Authority: Robert. S. Brain, Government Printer, Melbourne. Folio (34 x 21 cm): 32 pp. With all eighteen foldout plans. Unbound and stapled. Text and plans clear and complete. In fair condition, with slight rust to staples and the last leaf (carrying Plan XVIII) loose. 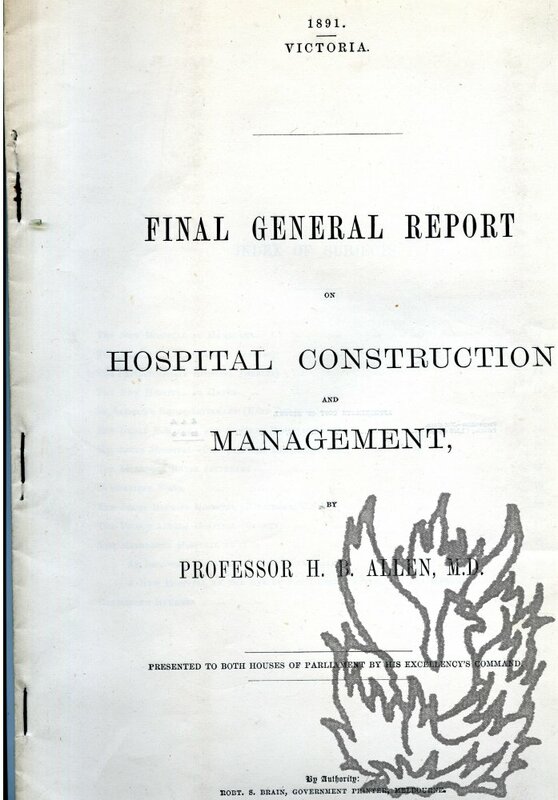 The report is addressed to 'The Honorable the Premier of the Colony of Victoria', and dated 'University of Melbourne, 2nd November, 1891. This is, as Allen sets out his aims in the first paragraph, explaining that he is submitting 'the Third and Final General Report concerning my visit to Great Britain and the Continent of Europe.